Last month, I woke up in Marrakech, Morocco, attending the 22nd Conference of the Parties to the United Nations Framework Convention on Climate Change (COP22), to the news that Donald Trump won the U.S. Presidential Election. Immediately the future of climate action became unclear, thrown into question by the possibility of President-elect Trump carrying out many of his campaign promises. Though PE Trump has softened his stance on many of his more extreme tweets, environmental protection still faces a great deal of uncertainty from a national perspective. 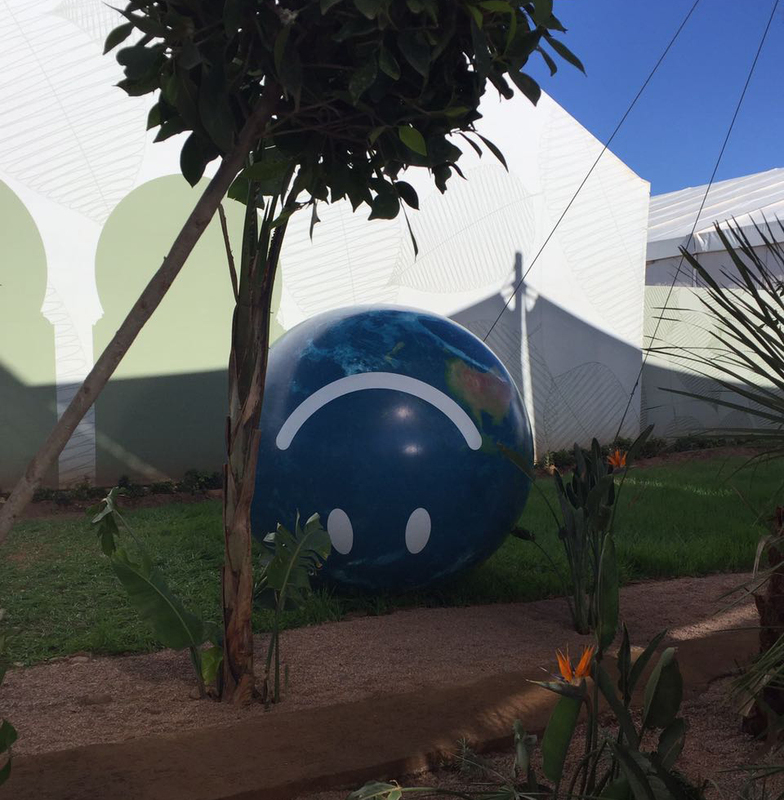 The day after the election at COP22. Photo credit: T. da Silva. Soon after the news settled in, I remembered two key facts that makes me hopeful for the next four years: the clean energy revolution has already begun (and in many ways is just getting started) and subnational and private sector action will prevail in the face of a halting or regressive national climate policy. Most of this can be backed by powerful public and bipartisan support. One of the key passages of the Paris Agreement was inclusive of non-state actors. During COP22, I attended a side event on the enhanced role of non-state action with the high-level climate champions and other esteemed speakers, who asserted that 80% of future climate action will come from non-state actors. I strongly believe that local/state actions, sustainable businesses, and clean energy investments will carry us forward to our future green economy. In fact, as I was leaving Marrakech, 365 corporations announced support for the Paris Agreement, in a public statement directed to PE Trump, "we want the US economy to be energy efficient and powered by low-carbon energy," and, "failure to build a low-carbon economy puts American prosperity at risk." More than 80 of the world's leading companies have made a commitment to go 100% renewable. Facebook, Microsoft, and IKEA are among a coalition dedicated to transitioning to 100% renewable energy called RE100, aim to eliminate any reliance on energy produced from fossil fuels. Recently, Google announced it will to switch to 100% renewable energy in 2017, and intends to run all of its operations on wind and solar energy. 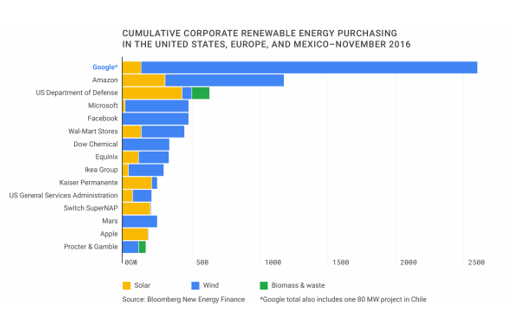 Google's energy consumption is nearly as much as the city of San Francisco, and is by far the leading corporate renewable energy purchaser in the world. Top businesses are not the only supporters of the Paris Agreement and the U.S. transitioning to a clean energy future. Americans all across the political spectrum understand that switching from fossil fuels and our dependence on foreign oil, to a clean energy sources at home strengthens our economy, reduces our emissions, and increases our ability to adapt to future risks. 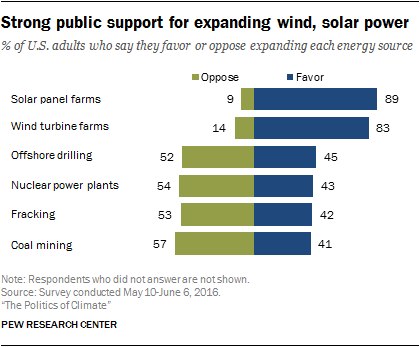 According to this chart, large majorities of Americans favor expanding renewable sources to provide energy, and the public is far less supportive of increasing the production of fossil fuels, such as oil and gas, and nuclear energy. Lucky for us the clean energy revolution shows no sign of stopping - global renewable energy investment totaled $268 billion just in the last year (only 25% of the goal set forth by the Paris Agreement). This past year, not only has solar became the world's cheapest form of energy, but the solar industry has surpassed the fossil fuel industry in job creation as well. U.S. states are leading the way with increased renewable portfolio standards and new climate legislation, including in states with a governor and legislature on opposite sides of the aisle. For example, California passed the nation's most ambitious climate change law, Illinois passed the one of most comprehensive state energy bills ever crafted, New York is aims to source 50% of its electricity from renewable sources by 2030, and Maryland signed a landmark climate legislation, setting a model of bipartisanship nationwide. Last month, I attended the Clean Energy Savings for All Summit in Baltimore, MD, and learned how powerful community-driven action can be. In spite of a two year freeze in Ohio on their renewable portfolio standard (RPS), Cuyahoga County has set an example as a leader in clean energy innovation. Local efforts include building the first solar farm in a landfill that will help power 17 county buildings, working with a local utility to help low to moderate income customers gain energy efficiency upgrades, and utilizing smart data to make future decisions about clean energy development. All of this community-driven action on clean energy is blooming in spite of the state-wide freeze, which was recently struck down by its governor, citing the need for the state to move towards job creation. At home in Washington, DC, this past month I was asked to to judge a climate innovation competition I won last year, that serves to foster local solutions to our climate challenges in cities worldwide called Climathon. All of the finalist teams were passionate about the solutions that they had developed, and the issues they were solving were grounded in real city challenges; not just in DC, but all over the world in 59 cities across 6 continents. These types of city public-private partnership solutions are key to the future of climate action, especially when multiplied and brought to scale. This efforts will become increasing important in the face of the next administration. Local action to meet global goals will carry out the imperative to mitigate dangerous carbon emissions and adapt to the ever pressing reality of our changing ecosystem.